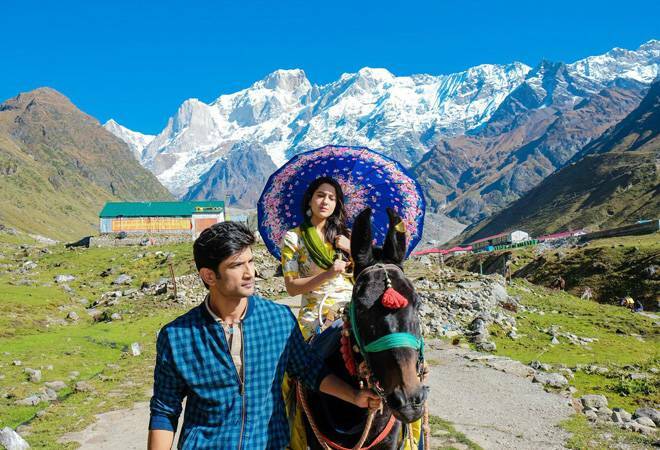 Kedarnath Box Office Collection: Can Sara Ali Khan-Sushant Singh's movie survive 2.0's craze? Kedarnath is anticipated to face its toughest challenge as Rajinikanth-Akshay Kumar's movie. Sara Ali Khan's debut movie with Sushant Singh Rajput, Kedarnath, has released today after a spate of controversies. However, with competition from a juggernaut like Rajinikanth and Akshay Kumar's 2.0, the fate of Kedarnath will only be clearer after its first weekend. Trade analysts however believe that the movie will do decent business initially. Abhishek Kapoor, the man behind movies like Kai Po Che! and Fitoor is helming Kedarnath. Set against the backdrop of the Uttarakhand floods in 2013, Kedarnath revolves around a Muslim porter and the daughter of a Hindu priest who fall in love. The interest around Sara Ali Khan is expected to boost Kedarnath's business. Her recent interviews and appearances have surely helped in boosting her influence. Additionally, Sushant Singh Rajput also has his own very loyal fan base. However, a couple of things may not go in favour of Kedarnath. For instance, Kedarnath does not have any big names supporting it. So, people may opt for a film with A-listers - at this point, 2.0 fits that bill perfectly. Speaking of 2.0, Kedarnath is anticipated to face its toughest challenge as Rajinikanth-Akshay Kumar's movie. 2.0 is not only working well in India, it has surpassed big Hollywood movies like Fantastic Beasts: The Crimes of Grindelwald and Ralph Breaks the Internet. It is a mammoth challenge to overcome for a movie with no big names. To make matters worse, a ban has been imposed on the screening of Kedarnath in seven districts of Uttarakhand. Following protests by Hindu outfits, the District Magistrates decided to ban the movie to keep the situation in control. Dehradun, Haridwar, Nainital, Udham Singh Nagar, Pauri, Tehri and Almora are the districts where the movie has been banned. A lot also rides on the word-of-mouth. If negative, the word-of-mouth can alone obliterate a big release like Thugs of Hindostan and Race 3. So far, the movie has managed to garner mixed reviews but Sara Ali Khan has been praised unanimously for her performance. Factoring in all these points, trade analysts believe Kedarnath will make around Rs 5-6 crore on its first day. How well the movie can cash in on Sara Ali Khan's magic remains to be seen.